With the chilly temperatures of winter subsiding and the warm weather of spring on the way, you might be starting to think about spending a little bit more time outside. 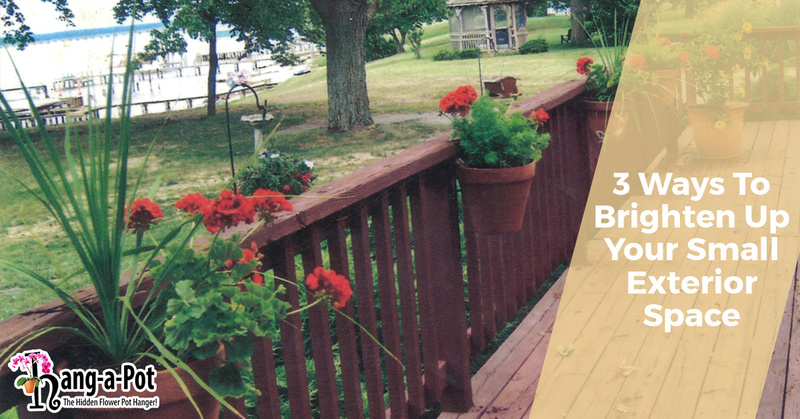 With that thought in mind, you may be considering how you can spruce up your outdoor living space this spring. Whether you’re in a new place and looking for decorative ideas, or you’re just looking to give your patio a face lift, Hang-A-Pot has the solution for you. Regardless of the size of your outdoor living space, our hidden pot hanger provides a versatile solution to your outdoor gardening and decorating! Have you ever seen a picturesque painting of a quaint European city street setting? Picture the cobblestone streets and locals sipping their tea or coffee next to a beautiful window flower box full of lush impatiens and trailing dichondra. You can recreate this beautiful scene right on your own patio with a few terra cotta pots and Hang-A-Pot. The possibilities are endless with a bit of creativity. For a clean, fresh look, consider a white-blooming flower surrounded with lush greenery. For a more dramatic look, consider trailing or cascading flowers. You’re sure to receive compliments from your neighbors on your new window box effect created with the help of Hang-A-Pot! There’s nothing better in the spring and summer than fresh herbs and vegetables from the garden. If your current home has an exterior space that is too small for a garden or your HOA rules and covenants don’t permit you to have a vegetable garden, Hang-A-Pot may be the perfect solution for you! With the hidden pot hanger, you don’t need a large plot of land in order to enjoy fresh produce from your own garden. You can create hanging garden pots for a vertical garden with ease. Check out our photo gallery for vertical gardening inspiration! Having a small exterior living space has its perks with minimal maintenance needs, however, it can be challenging to come up with creative ideas for vertical surfaces such as decks, walls, and fences. Imagine the possibilities if you could vertically mount beautiful flower arrangements outside! With Hang-A-Pot, this dream can become reality because it is the perfect wall-mounted flower pot holder. Its versatility and durability provide countless outdoor decor options for your small space. Consider a beautiful floral display mounted to the side of your house, or a colorful rainboots mounted to your fence filled with bright, cheerful flowers. Hang-A-Pot attaches easily to most surfaces and is constructed from durable polypropylene. This ideal material is designed to withstand extreme hot and cold and is UV resistant. Additionally, Hang-A-Pot is stress-tested to support over 100 pounds of weight. That’s strength you can count on! The makers of Hang-A-Pot understand that decorating small exterior spaces can be a challenge. With limited space and surfaces, you might feel as though your options are limited. Luckily, with Hang-A-Pot, this doesn’t have to be the case. Curious? Order Hang-A-Pot today to discover how it can beautify even the smallest of exterior spaces!